Up until recently I harboured very little interest in Genestealer Cults. I almost saw them as something as a gimmick. Sometimes even a meagre side dish opposed to the main meal that are the Tyranids. However, with this new codex dropping alongside a host of new models I spent some time delving into their possibilities and potential. Almost like an unsuspecting hiver on a backwater world, I found myself hypnotised by the gaze of a long-hidden Genestealer. 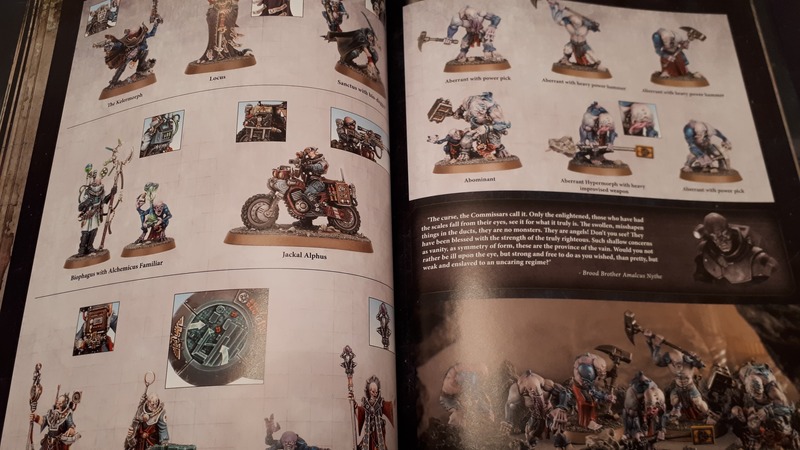 I received a copy of Codex: Genestealer Cults from Games Workshop and began thumbing the pages with mild interest. I soon found myself landing back on the same page, rereading continuously; the segment in which the life-cycle is explained and how these cults come to be. The amount of detail is splendid and shows the Genestealer Cults as the complex and devoted covens that they are. Explanations on how these cults operate and act to overthrow worlds is exciting to read and adds appeal to them. Some of the detail gone into regarding the “day of ascension” is particularly harrowing. It truly provides a grimdark feel to the codex. The sheer thought of a planet falling to these cultists within hours of brutal and swift combat. The feeling of untold elation upon their Tyranid masters appear from the stars. Finally, the fall to panic and terror as their revered gods, idols and children begin to eviscerate and butcher them. Grimdark indeed. I’ll not go into further detail, but the amount of detail gone into in Codex: Genestealers is one of my favourite things about it. However, there’s more to this new codex than just that. There are a flurry of new models coming out alongside the new book and these certainly warrant mention, too. For new character models the Genestealer Cults appear to be receiving similar treatment as the Death Guard did. The tirade of new HQs and Elites are one of the most notable inclusions with the update for the faction. Updated models for existing roles are available such as the new Magus model, but there’s plenty of new ones, too. Clamavuses act to spread to the word of their overlords, whereas the Sanctus can pop up from the shadows and assassinate enemy characters and psykers. There are plenty more models added to the lineup, too. The new Atalan Jackal attack bikes really help to bolster the guerilla warfare flavour that the Genestealer Cults delve from. A new fortification is even available in the form of the rather sizeable Tectonic Fragdrill. 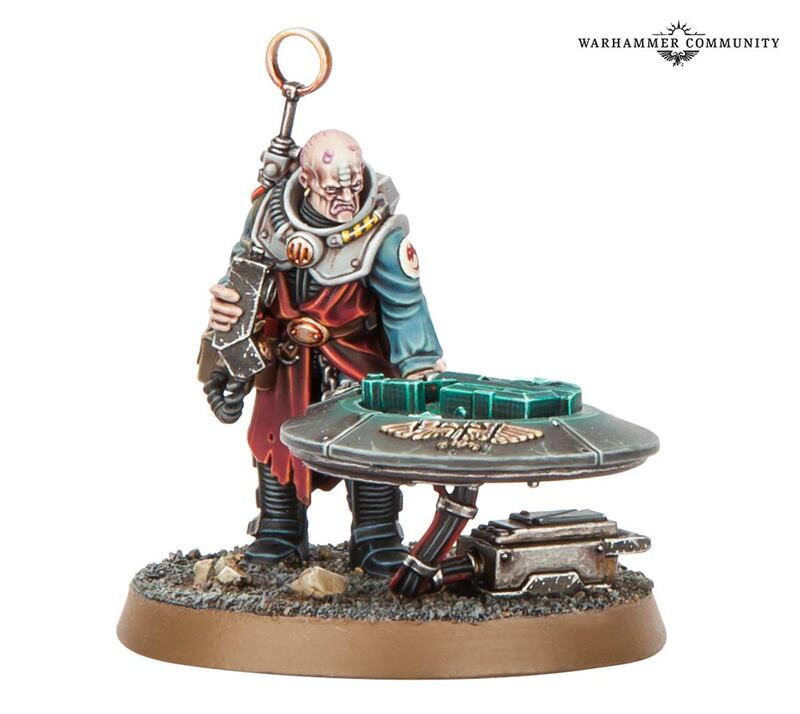 Most of these new models take the Genestealer Cults’ already fascinating gamestyle and add to it further. Whether it leadership buffs, character assassins, ambush-specialists and more. Codex: Genestealer Cults appears to be the final old edition codex being brought into 8th edition Warhammer 40,000. As such, like the cults themselves, the players of Genestealer Cults feel as though they’ve been waiting decades for this book to drop. There’s been hope for points drops for plenty of models, in some cases just to make them viable to take to the table at all. Fortunately, they’re prayers to their ravenous star gods seem to have been answered. From the hulking Patriarch to the humble Acolyte Hybrids, many models have seen points drops. Metamorphs have seen a points drop that I would foresee making them an exceptionally more popular choice than currently. Even the Goliath Rockgrinder truck seems to be cheaper. Although, it’s worth noting that the famed and ferocious Purestrain Genestealers look as though they are unchanged in price. With many models receiving a price drop in their points, accompanied by a whole host of new models and units, I’m keen to see how Genestealer Cults players mix things up with their lists here onwards. As previously touched upon, Genestealer Cults wait years, decades, often entire generations until the moment is right to overthrow their planet-side oppressors. Typically, when this happens planets can fall within hours thanks to lifetimes of planning and meticulous organisation. Ambushing and guerrilla tactics are the bread and butter of this faction, thus it is represented fairly well in their gameplay via the new codex. The codex comes with ambush tokens as default. In deployment you set these tokens up instead of units within your deployment zone. Then at the start of your first movement phase, or after your opponent if they have moved all their units first, you then reveal the tokens for the units you have chosen to have in your army. This allows you to be both reactive and proactive based on the options available to you and can turn a game on its head before the first turn is over. There’s a little confusion for me, however. From the FAQ last year for 40K the tactical reserves rules stated that in turn 1 players could no longer “deep strike” units outside of your own deployment zone. However, some Codex: Genestealer Cult units can be set up “underground” allowing them to pop up anywhere on the battlefield 9″ from enemy models at the end of any movement phase. Does the wording mean the FAQ doesn’t apply to these guys? Or is it simply an oversight? Not to worry, there’s plenty of clear-cut tactics and strategems further within the book. It appears most if not all Genestealer Cults units get the “Unquestioning Loyalty” rule. This acts as a “Look Out, Sir!” roll for any characters, which will help to keep them alive much longer. The new Creed traits add variety to the gribbly sub-factions where previously I saw none. Speaking honestly, I’d expect to see a lot of Twisted Helix cults prowling the boards soon. Giving Genestealer Cult models +1 Strength means that anything with claws, teeth or hammers becomes a more notable threat. Even my “hard-as-nails” Death Guard are feeling a little nervous. Codex: Genestearler Cults emerging into 8th edition feels like a fine codex on which to end for existing factions. It’s true to the source material and introduces a bucket-load of new and interesting units. It also makes the existing entries more appealing to take and use. The ambushing capabilities also makes the faction feel quite different to field than many others. 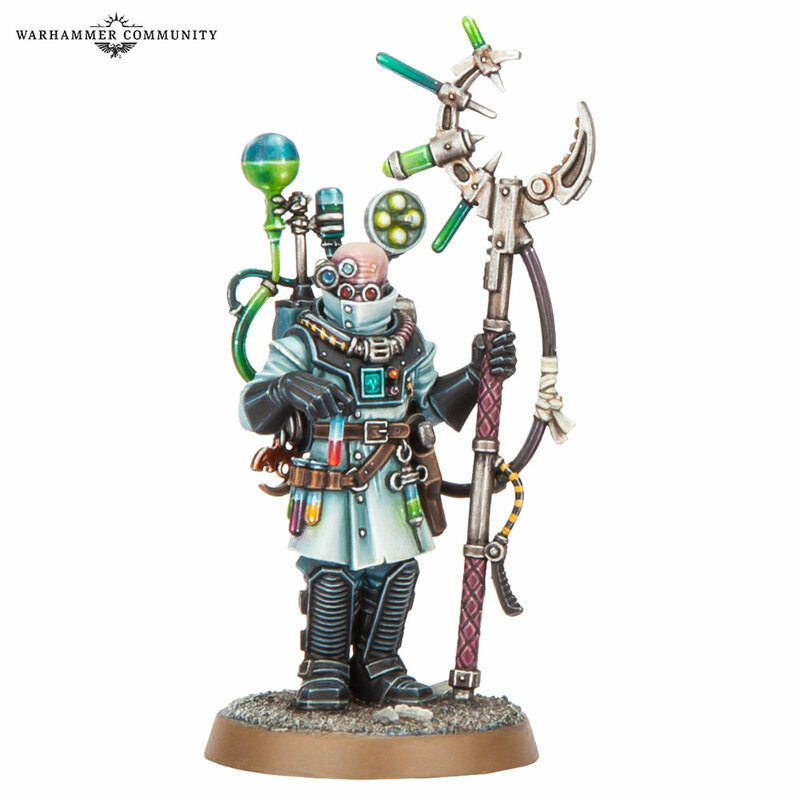 If you’re looking for an army that might be difficult to master but can bring entire planets to their knees in hours, this might be the codex for you. Just be sure you know when to hit and when to run. This leaves me with a final, burning question. What will be the next codex? An introduction of another faction or sub-faction? Perhaps Abaddon and the Black Legion will be landing on Vigilus imminently? Or, just maybe, Sisters of Battle players will soon have everything they’ve been waiting for and more. Be sure to pop by our Facebook page for all the updates and news we’ll be reporting throughout 2019.